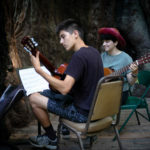 Cazadero Music Camp offers a music curriculum designed to help students advance their musical skill. Individual mentoring combined with several hours a day of group instruction helps students fine-tune their playing ability. Our unique Caz curriculum produces exceptional results for students year in and year out. Musicians participate in one of three major ensembles: Orchestra, Concert Band, or Jazz Ensemble. Led by a new guest conductor each week, major ensembles rehearse twice two to three times a day for 60-90 minutes, preparing for their final performance. Students are given several pieces of music to learn during the week. While some initially doubt they’ll be able to master the repertoire, students discover they are capable of rising to the challenge! Jazz band participation is by audition only and limited to one week in the two-week sessions. Jazz band instrumentation normally consists of trumpet, trombone, saxophones, and rhythm section (bass, guitar, piano, and drums). A Jazz Workshop elective is available for any and all instruments and performs at camper ensemble night. Auditions are held on the first day of camp. Faculty place students in ensembles based on skill level, instrumental needs, and conductor criteria. Students should prepare a short piece demonstrating tone, range, and technique in each genre that interests them. Campers are also required to sight read and play scales. Cazadero offers an Orff Program during Young Musicians Session as a primary ensemble. Campers who wish to participate should be prepared to sing, move, and collaborate with others. A certified Orff Schulwerk instructor and supporting staff will lead campers through improvisational activities, folk songs and games. The curriculum will be determined by the instructor and will likely span repertoire from multiple languages, genres, and time periods. Students will play barred instruments, world instruments, percussion, and additional props/costuming as deemed relevant by the instructor. Students are challenged to do their finest work in a relaxed, supportive atmosphere. A typical day involves three 60 minute rehearsals. Young musicians can expect to learn more about proper vocal technique, instrumental technique, phrasing, composition, literacy, improvisation, movement, and collaboration. Students in the Orff ensemble will prepare several pieces for the final concert performance in front of family and friends. The Orff program is open during Young Musicians Session to elementary students who have completed fourth or fifth grade by the upcoming summer. Experience in an elementary Orff or Kodaly music classroom preferred but not mandatory. Small group instruction in individual instruments is key to improving playing ability. Practice sessions for individual instruments help musicians focus on instrumental technique while mastering tone, timing, and other challenging aspects of the repertoire. Piano Program: Cazadero offers piano as a primary instrument and as an elective in all sessions. Piano Program students receive individual coaching, and play solo,in duets and in chamber ensembles. Campers who want to participate are required to submit a video recording of their playing in advance of their arrival at camp so we can choose appropriate music for their playing level. An additional $125 piano lab fee applies. Guitar Program: Guitar is available as a primary instrument and elective in the Middle School, Junior high and High School Sessions. Working primarily on acoustic instruments, guitar students play solo, in guitar ensembles and in mixed chamber ensembles. Our music staff sits amongst the students during ensemble rehearsals and they lead sectionals to offer instrument-specific lessons. Thanks to the exceptional music-staff-to-camper ratio of 1 to 4 at most, each student receives excellent individual attention. In order to provide a top-quality music camp program, we prioritize hiring and training an outstanding music staff. Caz recruits and hires not only the best musicians to be on staff, but we also look for people with special talent and expertise in teaching and mentoring youth. 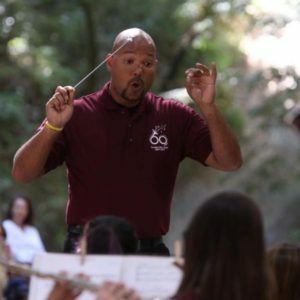 The Cazadero Music Camp Faculty are all highly accomplished practicing musicians and music educators. Our Counselors are all music students at the university level and Counselors-in-Training at the high school level. Most of our kitchen and utility staff are also musicians! We recruit guest conductors for our large ensembles from top universities and high school music programs to lead the ensembles. The conductors introduce challenging, interesting, diverse repertoire and teach the groups to play musically, improve their ensemble skills, and learn the context of each piece. The unique opportunity for our campers to experience a new guest conductor each week ensures ongoing variety and new musical challenges. 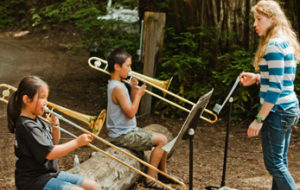 A variety of electives rounds out the Cazadero Music Camp curriculum. Students choose from electives such as music theory, composition, conducting, jazz improvisation, chamber ensembles and instrumental technique. In the Young Musicians and Middle School sessions, campers take part in an All Camp Choir as one of their electives. Non-musical electives are also offered including sports, dance, nature studies, and arts and crafts. Cazadero’s curriculum is rich and challenging, but campers still enjoy plenty of time for relaxing and supervised recreation. Learn more about Camp Life. In addition to our outstanding music staff at Cazadero, we also support a Guest Artist Program. 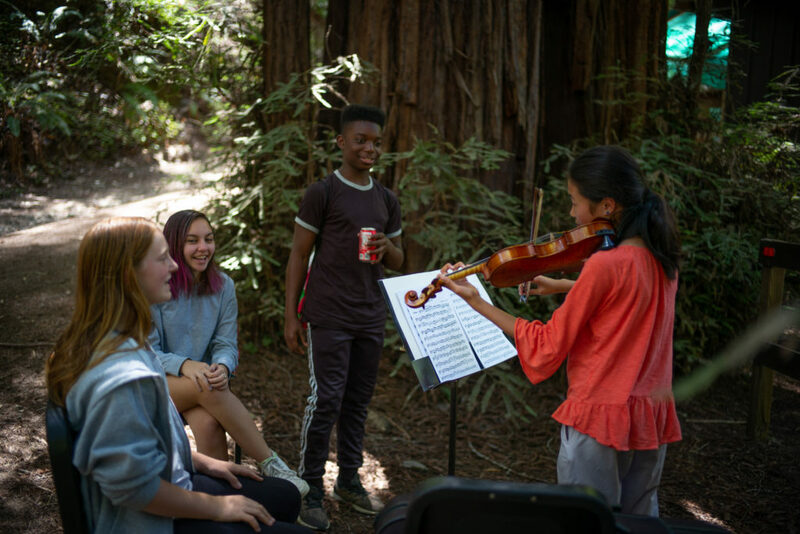 Each session professional musicians bring their talents to Cazadero Music Camp to share, perform and work with our students. View a list of Guest Artists who have performed at Cazadero. View a list of Guest Artists. Past Performances: A full listing of summer concert programs. 2018 Concert Schedule with dates, times and Guest Conductors.